Rendering of Austin Commercial Inc.'s planned extensions to the terminals at Los Angeles International Airport, which will connect to a planned people mover. The five-year contract, already awarded last year to Austin Commercial Inc. of Dallas, Texas, calls for the construction of seven structures extending from the nine terminals at LAX. Inside the structures would be walkways, escalators, elevators and other amenities. The $2.7 billion automated people mover – which is now in the bidding phase among five construction contractor teams – is intended to whisk passengers between three sites: a consolidated car rental facility more than a mile east of the airport, a station that connects to the Metro Green Line light rail route and the central terminal area. It is the centerpiece of the $5.5 billion landside access modernization program now under way to ease congestion in and around the airport complex. 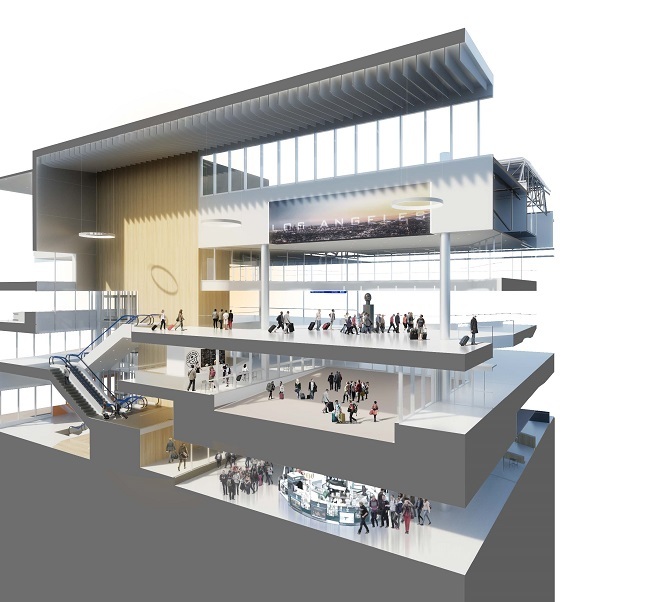 According to a staff report presented to the Board of Airport Commissioners this month, the walkways, escalators and elevators that will be built inside the terminal extensions will give people easier ways to move between the people mover, which will drop them off at the upper levels of each terminal, and the different floors. The contract also calls for constructing covered walkways connecting the people mover and the seven terminal extensions, according to LAWA spokesman Fred Badlissi. Three of the terminal extensions are slated for the airport’s south side, covering Terminals 5 through 8; one onto the Tom Bradley International Terminal and two for Terminals 2 and 3 on the north side. The remaining extension is to be integrated into another planned structure known as Terminal 1.5 planned for between Terminals 1 and 2, Badlissi said. Besides the walkways and elevators, the terminal extensions will include offices, baggage areas, lounges, restrooms and other amentities. The people mover and the terminal extensions are set for completion around 2023. Economy, education, energy and transportation reporter Howard Fine can be reached at hfine@labusinessjournal.com.